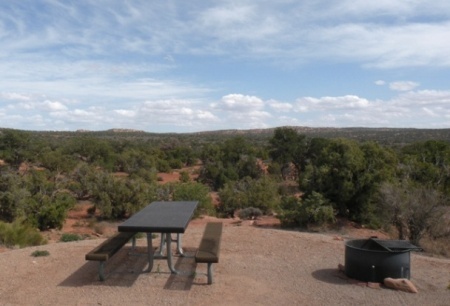 These are the SE Utah Campsites we've occupied in our RV Boondocking Travels. The Arbitrary lines I've drawn to mark off the SE Quarter of the state is an East/West line through Nephi, on I-15 on the North and Hwy 12/Boulder on the West. Type of Camp: Improved Fee 14 Day limit at $12/day. Number of Sites 60 sites. Rig Size Limitations Many sites adequate to accommodate large RVs. Saw a couple good sized motorhomes with toads, along with our 30' fiver. I'd expect you to be able to find a spot for at least a 36 foot and likely a 40 footer. Road Surface Hwy 191 two lane paved. Hwy 313 Paved two lane. Graveled in campground. Graveled pads. Directions:Turn west from Hwy 191 onto Hwy 313 approximately 10 miles north of Moab. Go west 12 miles to the Campground turnoff. Watch for the sign on your right. Hwy 313 bends to the south just before you get to the camp turn so you'll turn right/west and Go 1/2 mile to the campground entrance. How We Found this Camp on our AAA "Indian Country Guide Map" and also Located it on The BLM website. Weather I experienced It was cool days and cooler evenings... and windy! Though it was nice down in Moab. Dead Horse Point State Park• 34 miles West of Moab off US 163 on Hwy. 313 - Free. (South of Horsethief)Water is available but you should arrive with full water tank. "Country Clean Laundromat" in Moab... is our WORST LAUNDROMAT ever... so far! :) It Would Be Best Avoided. High % of Machines out of service. One failed on us. There are a couple others in town.We saw a second that "Looked" good just to the south on the same side of the street next to the Village Market Grocery Store. 1. Very nice spacious sites. lots of room between for privacy. This is a DRY area. The camp has outhouses, but NO Water. You'll need to be tanked up on water when you arrive. The Long view from these SE Utah Campsites is awful pleasing with your morning coffee. There's a nice hiking trail that leaves right out of camp, and if your a four wheel drive sort, you are close to several routes here.